The feast day of St. Alphonsus Liguori, founder of the Redemptorists, is August 1. As we get ready to celebrate his special day, we invite you to join us in asking his intercession for all our needs and special intentions. 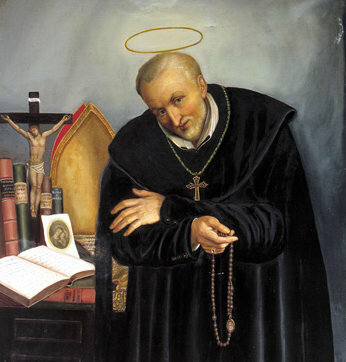 St. Alphonsus is the patron saint of confessors, moral theologians, and those who suffer from arthritis—a condition that caused him great pain and left him confined to a wheelchair later in life. Glorious St. Alphonsus, bishop and doctor of the Church, devoted servant of our Lord and loving child of Mary, I invoke you as a saint in heaven. I give myself to your protection that you may always be my protector and my guide in the way of holiness and salvation. Aid me in observing the duties of my state of life. Obtain for me great purity of heart and a fervent love of the interior life after your own example. Great lover of the Blessed Sacrament and the Passion of Jesus Christ, teach me to love Holy Mass and Holy Communion as the source of grace and holiness. Give me a tender devotion to the Passion of my Redeemer. Promoter of the truth of Christ, through your preaching and writing, give me a greater knowledge and appreciation of the divine truths. Gentle father of the poor and sinners, help me to imitate your charity toward others in word and deed. Consoler of the suffering, help me to bear my daily cross patiently in imitation of your own patience in your long and painful illness and to resign myself to the will of God. Good Shepherd of the flock of Christ, obtain for me the grace of being a true child of Holy Mother Church. St. Alphonsus, I humbly implore your powerful intercession for obtaining from the heart of Jesus all the graces necessary for my spiritual and temporal welfare. I recommend to you in particular this favor: (mention your request). I have great confidence in your prayers. I earnestly trust that if it is God’s holy will, my petition will be granted through your intercession for me at the throne of God. St. Alphonsus, pray for me and for those I love. I beg of you, by your love for Jesus and Mary, do not abandon us in our needs. May we experience the peace and joy of your holy death. Amen. Heavenly Father, You continually build up Your Church by the lives of Your saints. Give us grace to follow St. Alphonsus in his loving concern for the salvation of people and so come to share his reward in heaven. Walking in the footsteps of this devoted servant of Yours, may we be consumed with zeal for souls and attain the reward he enjoys in Your kingdom. We ask this through Christ our Lord. Amen. Say the daily novena prayer. This beloved Italian saint—the founder of the Redemptorists—was born in Naples, Italy, in 1696. Known for his piety even as a child, Alphonsus had many gifts and talents. He became a lawyer before reaching age 20,composed music and painted, drew large crowds with his preaching, and wrote more than 100 books. He was a brilliant theologian, yet he had a special gift for teaching the faith in a way even the simplest people could understand. As a young priest, he was deeply distressed by the conditions of the rural poor, who had few opportunities to learn the faith or have their spiritual and material needs met. In response, in 1732 he formed the Congregation of the Most Holy Redeemer—the Redemptorists—and intensified his life of preaching to and serving those in need. Profoundly devoted to the Blessed Mother, St. Alphonsus died at age 91, after spending the night in prayer to Mary. He was canonized a saint in 1839 and proclaimed a doctor of the Church in 1871. The Congregation he formed now numbers about 5,500 priests and brothers who serve the poor and abandoned in 82 countries throughout the world. Redemptorists are known for their special devotion to the crib of Bethlehem; the cross of Calvary; Mary, the Mother of God; and the Eucharist. Click to read a longer biography of St. Alphonsus.